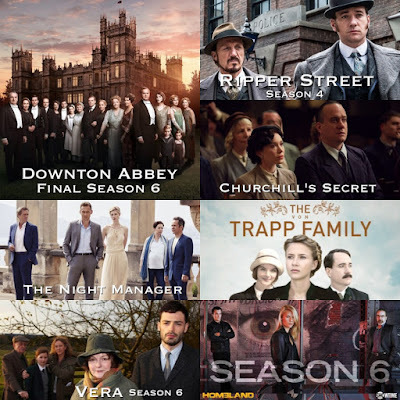 Tonight Downton Abbey(Penelope Wiltonco-star asIsobel Crawley) continues itssixth and final season on PBS Masterpiece with Episode 5 at 9/8c. In addition to 3New Pride and Prejudice inspired and related movies (Unleashing Mr. Darcy, Pride and Prejudice and Zombies, and Bridget Jones's Baby) to see in 2016! A new Jane Austen related movie coming soon, sometime this year. The new movie is titled Love & Friendship starring the lovely Kate Beckinsale(best known to Austen fans as Emma Woodhouse in the 1996 TV movie Emma) as Lady Susan Vernon Martin, Chloë Sevignyas Alicia Johnson, Morfydd Clark(Georgiana Darcy in the upcoming Pride and Prejudice and Zombies movie) as Lady Susan's daughter Frederica, Emma Greenwell (Caroline Bingley in the upcoming Pride and Prejudice and Zombiesmovie) as Catherine Vernon, and Stephen Fry as Mr. Johnson. Whit Stillman wrote (the screenplay), produced, and directed this movie. 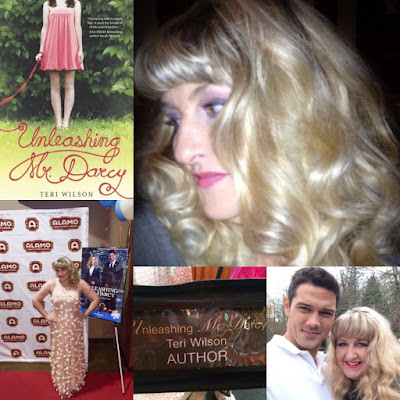 Unleashing Mr. Darcy(2016) starring Ryan Paevey & Cindy Busby Last Saturday, I watched and live tweeted the new Hallmark movieUnleashing Mr. Darcy starring Ryan Paevey as Donovan Darcy, Cindy Busby as Elizabeth Scott, andFrances Fisher as Violet Darcy. It premiered on Hallmark Channel (as part of their four Winterfest 2016 movies throughout this month with this movie as the last movie for the Winterfest event)at 9/8c. With today being the 203rd anniversary of Jane Austen's classicPride and Prejudicenovel, I thought it would be a great day to post my thoughts, opinion, and review ofthis new Hallmark movie, which was adapted from Teri Wilson's novel of the same name (released in 2013), a modern re-telling of Austen's classic Pride and Prejudice. 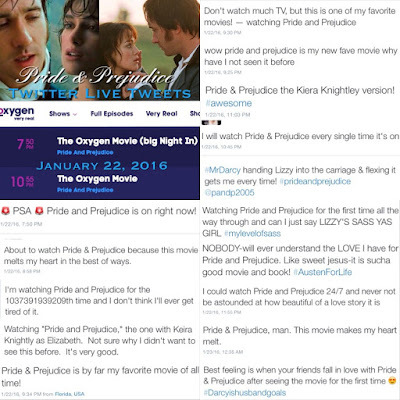 The cast PPZ movie (sans Sam Riley) attended the Premiere of Screen Gems' Pride and Prejudice and Zombiesfilm starring Lily James, Sam Riley, Bella Heathcote, Douglas Booth, Jack Huston and Matt Smith on January 21, 2016 in Los Angeles, California. Pride and Prejudice and Zombies opens in US Theaters February 5th, 2016. 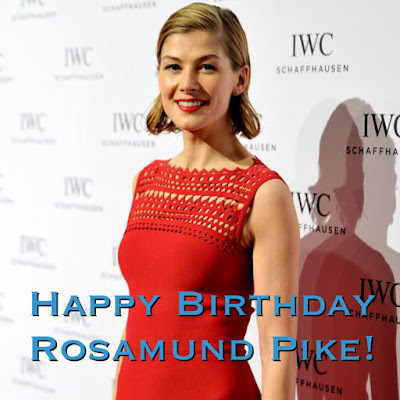 Today (January 27th) is the lovely and ethereally beautiful, nominated (and winner in some awards) for Best Actress (for her outstanding performance as Amy Dunne in Gone Girl) in various film critics awards plus Golden Globe, BAFTA, and Academy Award nomineeRosamund Pike (aka Pride & Prejudice's own Jane Bennet)'s 37th Birthday! All the best to her on her upcoming film projects slated to be released sometime later this year. Last Friday (January 22nd), Joe Wright's 2005Pride & Prejudice movie starring Keira Knightley & Matthew Macfadyen was back on TV twice (back-to-back this time) for its second broadcast of the movie in 2016. It was shown on Oxygen channel twice at 7:50 pm and 10:55 pm. The last time it was shown on TV (on Oxygen) was earlier this month (January 6th). I watched the first airing, but didn't live tweet until the second airing at 10:55 pm ET. Again, my fellow P&P movie fan and twitter friendRose Fairbanks joined me a bit on the live tweet fest of the movie (along with a few P&P movie fans who join in on the fun), and it was a lot of fun. I had so much fun! Thanks again Rose. 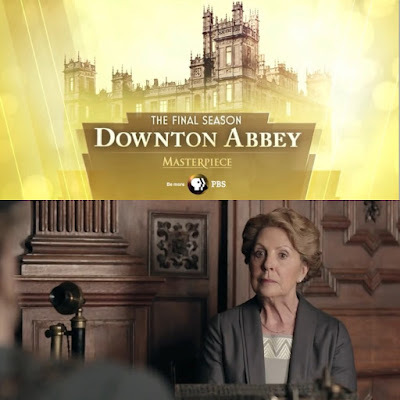 Tonight Downton Abbey(Penelope Wiltonco-star asIsobel Crawley) continues itssixth and final season on PBS Masterpiece with Episode 4 at 9/8c. 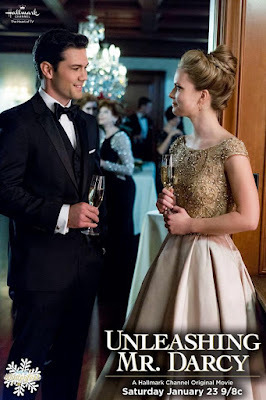 TonightUnleashing Mr. Darcy starring Ryan Paevey as Donovan Darcy, Cindy Busby as Elizabeth Scott, andFrances Fisher as Violet Darcy premieres on Hallmark Channel (as part of Winterfest 2016)at 9/8c. 2015 is now last year and we're now in the the middle or close towards the end of January in the New Year 2016! You know what that means, right? New TV series/returning shows and movies to look forward to this Winter and Spring from ourfavorite P&P (2005) actors! Continuing my annual list of some Pride & Prejudice (2005) alumni with a new movie and TV series or mini-series starting this month of January through April of 2016 (as well as a few upcoming films to see in mid to late 2016!). Featured P&P (2005) actors: Keira Knightley, Matthew Macfadyen,Rosamund Pike, Jena Malone, Kelly Reilly, Rupert Friend, Tamzin Merchant, Tom Hollander, Donald Sutherland, Brenda Blethyn, Judi Dench, and Penelope Wilton. 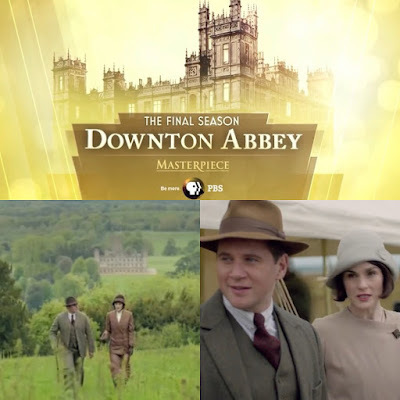 Tonight Downton Abbey(Penelope Wiltonco-star asIsobel Crawley) continues itssixth and final season on PBS Masterpiece with Episode 3 at 9/8c. 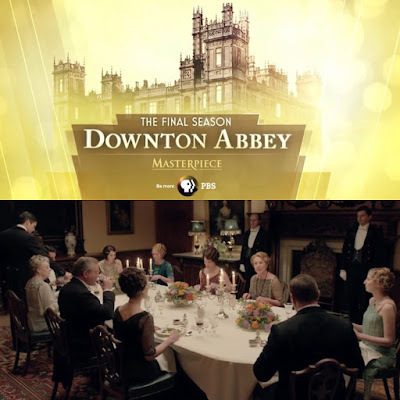 Tonight Downton Abbey(Penelope Wiltonco-star asIsobel Crawley) continues itssixth and final season on PBS Masterpiece with Episode 2 at 9/8c. 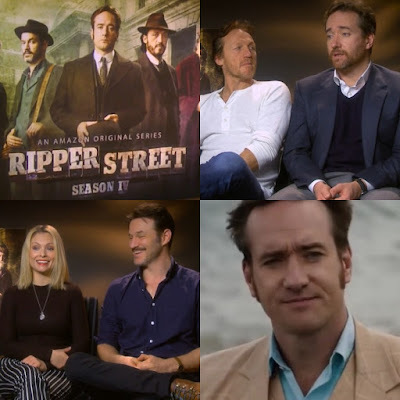 Watch: Digital Spy's Ripper Street Season 4 Matthew Macfadyen and Cast Interview and a Sneak Peek of S4's Episode 1! A new Digital Spy cast interview (in which they mentioned a possible S5 end for their series) and Sneak Peek of Episode 1 of Ripper Street starring Matthew Macfadyen, Jerome Flynn, and Adam Rothenberg has been released as Season 4 premiere fast approaches. It premieres next week, January 15th, on Amazon Prime Video UK. First Photo: AMC's The Night Manager starring Tom Hiddleston, Hugh Laurie, and Tom Hollander premieres April 19th! Two images including the main cast (see the still photo above ^ via Collider) has been released of AMC’s The Night Manager, based on John le Carré‘s spy novel, is a new six-part miniseries starring Tom Hiddleston, Hugh Laurie, Tom Hollander, and Olivia Coleman. FYI: AnInteresting Jane Austen connection between these 3 stars of The Night Manager: Tom Hiddleston played Mr. John Plumptre in Miss Austen Regrets, Hugh Laurie was Mr. Palmer in Sense and Sensibility 1995 film, and of course, Tom Hollander was Mr. Collins in Pride & Prejudice 2005 film. Here’s the official synopsis for The Night Manager for more info. 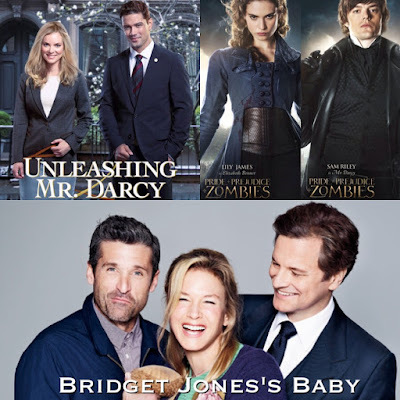 New Pride and Prejudice inspired and related movies (Unleashing Mr. Darcy, Pride and Prejudice and Zombies, and Bridget Jones's Baby) to see in 2016! Last Wednesday, Joe Wright's 2005Pride & Prejudice movie starring Keira Knightley & Matthew Macfadyen was back on TV twice (but not back-to-back as it usually does) for its first broadcast of the movie in 2016. It was shown on Oxygen channel twice at 6:30 pm and 10:30 pm. The last time it was shown on TV (on Oxygen) was on Christmas Eve 2015 with back-to-back airing, which I missed both times. This would've been part 10, but I'm only posting the ones I got to watch and live tweet with. So, it's part 9, it is. I missed the first half of airing of the movie this past Wednesday, but was able to catch the second half of it. Then, I watched and live tweeted the second airing at 10:30 pm ET. 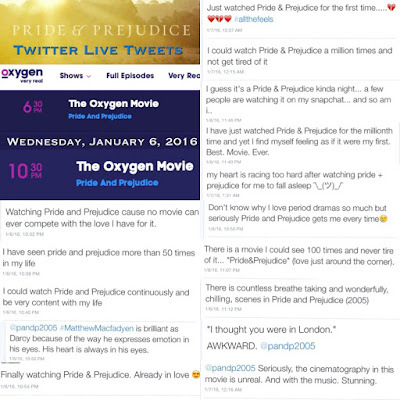 This time, my fellow P&P movie fan and twitter friendRose Fairbanks joined me on an epic and live tweet fest of the movie (along with a few P&P movie fans who join in on the fun), and it was a blast. I had a great time! Thanks Rose. 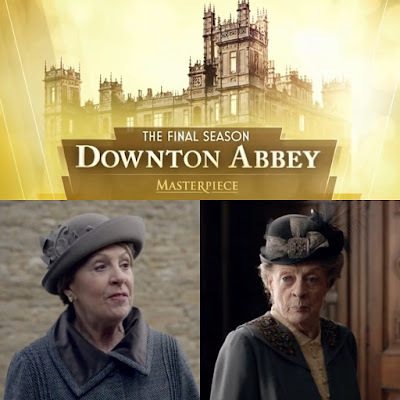 On TV Tonight: Watch Penelope Wilton in Downton Abbey's Final Season 6 Premiere on PBS Masterpiece! The long wait (for US fans) is over! Tonight Downton Abbey(Penelope Wiltonco-star asIsobel Crawley) kicks off itssixth and final season on PBS Masterpiece at 9/8c. Episode 1 will be 90minutes long and will be set in 1925, six months after the events of season 5. 2015 has been a really wonderful year for this P&P '05 Blog and it's all because of YOU. Thank YOU all so much for visiting, reading, and commenting here and for making this year, a great year! Like last year, I had a great time posting, updating, and keeping this Blog and P&P movie alive all year. 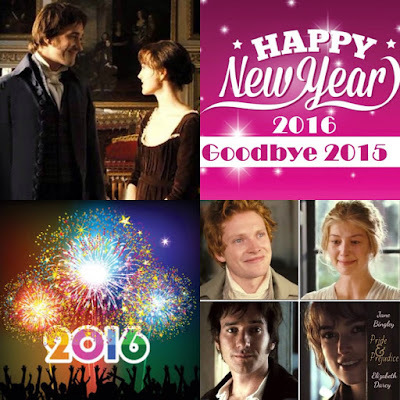 My favorite moments and posts this year has to be: All thePride & Prejudice (2005) movie's 10th Year Anniversaryposts. Hope to continue and keep going this year (2016) and beyond...well hopefully for many more years to come (or for as long as I can). Special THANK YOU to all my P&P Blog Contributors/Friends: Sharon Lathan, Natasha Shubrick(thanks a lot for joining me here this year and for all your monthly blog posts for this blog), Christy Farmer, Regina Jeffers, Karin Quint (of the Dutch Jane Austen website: Jane Austen.nl), andMaiafor participating in our P&P (2005) Movie's 10th Anniversary event last September!